North Korean media Thursday reported on another inspection of construction efforts in Samjiyon by leader Kim Jong Un – his fourth in the last year and first in 2019. But despite Kim’s claims that “the appearance of the township has changed so much in several months” and that “much progress” had been made over winter, open source data suggests otherwise. A comparison of satellite imagery courtesy of Planet Labs and on-the-ground photos released in state media reveals few apparent changes to unfinished structures rapidly built throughout the town in the latter half of 2018. The only major changes appear to have been in the clearing of land and demolition of some older buildings near the base of the Pegaebong ski hill, likely part of the “second-stage construction projects” mentioned in Thursday’s report. Construction on the resort buildings does not appear to have begun yet, though some of the forested area between the base and the existing outdoor speed skating rink was cleared since early last November, satellite imagery shows. According to a map released by KCNA last July, the resort will comprise eight to ten buildings at the base of the hill (shown at the very top of the map above), including lodging and ski equipment rental facilities. 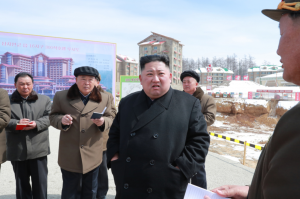 Kim Jong Un was pictured standing before large render boards for 300 and 500-room hotels this week, though neither appear to be part of the resort area. The 300-room hotel (shown as 302 rooms in another information board in the image) is instead located on the east part of town towards the train station. The location of the 550-room “Samjiyon Hotel” is less clear, but it may be located in roughly the same area according to the appearance of surrounding buildings. Some older buildings slated for demolition according to the map were indeed knocked down over winter (labeled “new demolition” on the left of the satellite image above), though the entire area will need to be cleared for planned equestrian facilities, a park, and traditional Korean lodgings. The area in the center of the above image circled in yellow shows the new land cleared for the resort, while the area circled to the left is, according to the official map, for a separate complex of buildings – both of which appear to be in the early stages of construction as of this spring. Temporary blue tents seen scattered elsewhere throughout Samjiyon now appear in the newly-cleared area to the left of the image, indicating work is set to pick up pace on the new complex of buildings soon. 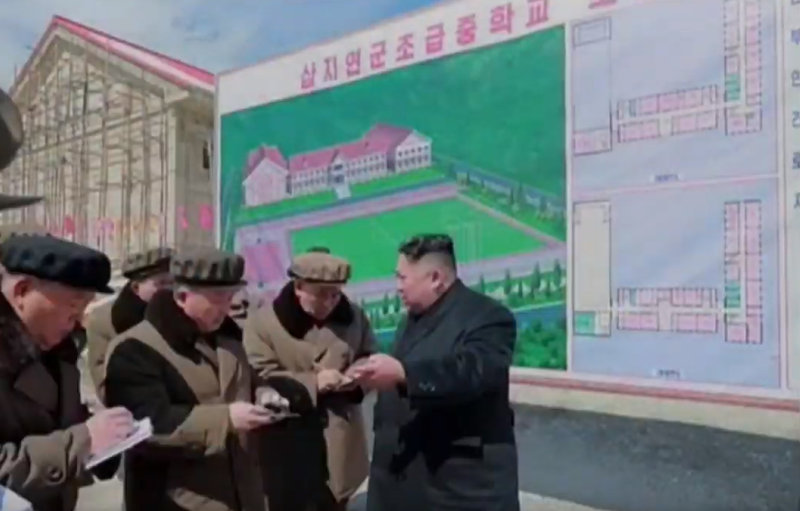 Another change visible in the latest images appears at the site of a new middle school, which Kim inspected according to additional images released in the Korean Central Television (KCTV) broadcast of the visit on Thursday. Roofing installation on the school appears to have been completed in the winter months, a comparison of images taken during Kim’s last visit in October and his latest this April shows, circled in red on the left side of the below image. 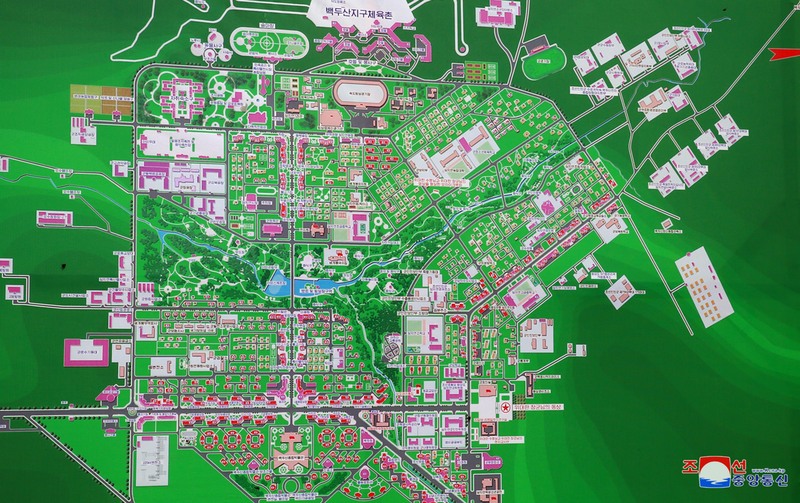 There are also signs the map released by KCNA last July is under revision, however – much like the map for North Korea’s other major tourist construction project in Wonsan-Kalma. The yellow circled area in the center of the above image shows that a group of nine small buildings was demolished in recent months, despite these buildings being included in the official blueprint. This may be the site of the new 550-room hotel. But besides the small changes detailed above, the building exteriors along Samjiyon’s main east-west boulevard, for the most part, appear the same this month as they did last October. The buildings on the north end of town as well still appear with their concrete facades, with most already having received their roofing before winter. 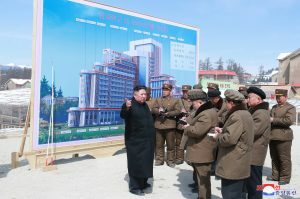 It could be that the progress to which Kim referred during his latest visit was made mostly on building interiors, but the whole of the town otherwise does not appear to have seen much progress in recent months. The target completion date for the project remains unchanged, however, with Thursday’s report naming the deadline as the 75th anniversary of the founding of the country’s ruling party, or October 10, 2020.